Misdirection and good directing can — and sometimes do — go hand-in-hand. Take Deadwind, for example. This new Netflix drama is the latest in a long and growing list of Nordic noir thrillers marked by intelligent writing for adults; fine acting by unfamiliar actors; and competent, confident direction by art-house filmmakers you’ve never heard of. Deadwind hails from Finland — not a first exactly for North American viewers but close — and it has many of the signature marks familiar to anyone who’s seen Swedish-Danish thrillers like the original The Bridge (Bron in its original Swedish; Broen in Danish) and the original Wallander: rain-slicked streets, gray skies and a readily identifiable, growing sense of paranoia and creeping dread. If Ingmar Bergman had made serialized dramas for the small screen, they would have looked much like Bron and Deadwind. Deadwind — Karppi in its original Finnish — is not exactly a grabber of a title, but don’t let that dissuade you. Much like the mystery that forms the basis for Deadwind’s plot, it has a double meaning. A body of a young woman is found buried near an industrial development project. The project is an experimental housing community that will be powered entirely by wind turbines made from a proprietary — and untested — material that is both durable and cost-effective. A material, in other words, that could not only put fossil fuel companies out of business but could conceivably put rival green-energy companies out of business, too. The entire project hangs in the balance. A critical city council vote is just days away; media, politicians and rival companies in both Finland and Germany are on tenterhooks awaiting the outcome of the vote, and there’s a sense that the decision could affect new housing projects across northern Europe — and anywhere in the world where it’s cold in winter — for generations to come. The stakes are sky high, in other words, and the enemies list is long. It quickly becomes evident that Deadwind is about a lot more than a simple, one-off murder case. Deadwind is full of open questions, deadly distractions, and deliberate misdirection. 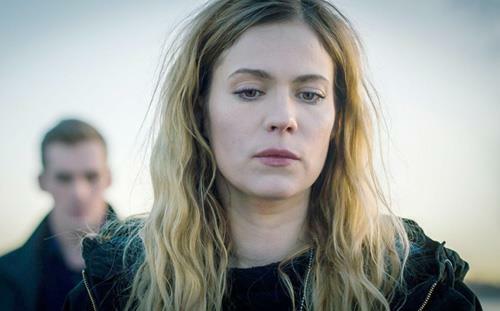 It’s that unpredictability — you may think you’ve seen this before, in countless other TV dramas, but you haven’t really — that makes Deadwind such a hypnotic thriller. I hadn’t intended to, but I burned through all episodes in two days. Deadwind is the very definition of a binge-watch, even though the characteristically leisurely European pacing may seem slow at times to viewers more used to traditional US action dramas like NCIS and Hawaii Five-0. In look, style and tone — though not in political overtones — Deadwind most resembles the original Danish version of The Killing (aka Forbrydelsen), and that can’t be a coincidence. The Killing changed the very way TV serial thrillers get made in the same way the original Girl with the Dragon Tattoo flipped the entire film industry on its side. Deadwind is not as tightly wound or original as The Killing — how could it be? — but it has much to recommend it. As with The Killing, red herrings abound. Suspects come and go, and the mystery keeps changing. Things that seem obvious turn out to be not so obvious and everyone seems to be hiding a secret — some trivial, some serious. That will no doubt irritate some viewers, but at no point do the plot twists and turns seem contrived. As with any decent thriller, though, it’s the characters, not so much the look and feel, that make Deadwind so absorbing — the offhand, subtle reminders of day-to-day life that really drive Deadwind’s appeal. The lead detective on the case, Sofia Karppi (theatre-trained Helsinki native Pihla Viitala, top), is damaged but not defective. A recently widowed mother of two children, she has reluctantly moved back to her native Finland after a promising career as a detective in Germany was derailed by a tragic traffic accident that claimed her husband’s life. She’s assigned an adversarial first-year detective, Sakari Nurmi (Lauri Tilkanen, left), as her partner, and before you can say Sarah Linden and Stephen Holder, the two are clashing like, well, Sarah Linden and Stephen Holder. Over time, though, as pieces of the puzzle seemingly come together, only to fall apart again, they see more eye to eye. It’s the way that relationship develops over the course of Deadwind’s entire, slow-burning first season that shines a light on the quality of the storytelling. In many traditional, network TV dramas, characters don’t change. Here they do change, and the change is profound. Even the supposed villains are not all who they seem. 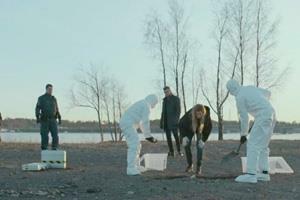 Would-be green-energy tycoon Alex Hoikkala (three-time Jussi Award winner Tommi Korpela, in a terrific performance) makes an especially effective foil to Sofia Karppi’s brittle but detail-driven detective. It’s genuinely hard to tell from one moment to the next whether the green-energy advocate is an environmental crusader driven by a desire to save the planet or a homicidal psychopath who cares only to advance the interests of his company and make lots of money on the side. It’s telling, too, to see how deftly and subtly Deadwind’s creators touch on the existential issues of day-to-day life, from alcoholism and drug addiction to teen sexuality, online bullying and whether a recently widowed career woman can raise two difficult children on her own while juggling a life-and-death job on the side. 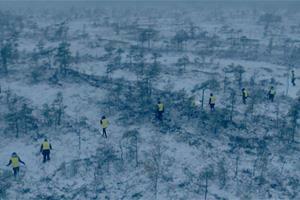 Comparisons between The Killing and Deadwind are apt, right down to the dark skies, starkly beautiful early-winter snowfalls and gloomy mood music. This is compelling, adult drama at its finest and most addictive. Netflix posted Deadwind on Aug. 25 with little publicity and practically no warning, even though it was already a sensation in Europe. It’s a find, in other words. And a good one. Am I too sensitive? Isn't it rather repetitive, not to mention disturbing, to continue to have women imprisoned? Can we do without that plot device? Thanks for the heads-up. I would never have known about this gem without reading your article.